Winter Park Resort rises 12,000 feet above sea level and 56 miles beyond Denver. It is a destination rich with history and experiences. Nestled in its breathtaking setting of seven unique territories, the resort prides itself as being an eclectic place for all types of skiers, snowboarders and pleasure seekers. Another reason for its popularity is the famous Ski Train which began operating from Denver’s Union Station to the base of Winter Park in the 1940s. This train experience, unique in the United States, breathtakingly wines from Union Station, over mountain switchbacks and under 31 tunnels. The last of these tunnels, Moffat Tunnel, is the third longest and highest elevation tunnel in the United States. As the culmination of the trip, Moffat offers 15 minutes of pitch blackness then brilliantly delivers passenger directly onto Winter Park’s doorstep. This train route was highly popular for its 60+ years, however in 2009 the private company operating the Ski Train could not continue the service and the experience ended. Yet, in 2017, due to high demand, the route is being revived for a new generation. Create a memorable gateway that efficiently and graciously ushers visitors into Winter Park. The site and budget for these new amenities is constraining, so the improvements have to be minimal yet potent and multi-functional. The existing platform area with its 12’ tall earth berm wall suffers from a lack of amenities, visual richness, and directionality. To solve access and security concerns a system of fences and gates are constructed using a welded wire mesh that is visibly implemented throughout the resort for different functions. Projecting this local material towards a new future, a series of metal wire gabion baskets are filled with blue-green, recycled glass slag and back-lit with LED fixtures. These panels are installed along the earth berm wall in a rhythm that accelerates closer to the entrances and exits, helping to provide illumination, direction and interest to the blank walls. To insert itself into the rich train line from Denver’s International Airport and Union Station it is necessary to deliver a new scale and look to the Winter Park visitors. Light poles are installed in a regimented rhythm, in contrast to the glass gabion panels, and establish a higher plane for the platform. Over each established portal, an unique roof form is installed. These roofs are tailored to best direct pedestrians and to act as visible markers for returning to the train. Together these new additions can be seen as a formal morphology from the structures at DIA to Union Station to Winter Park. 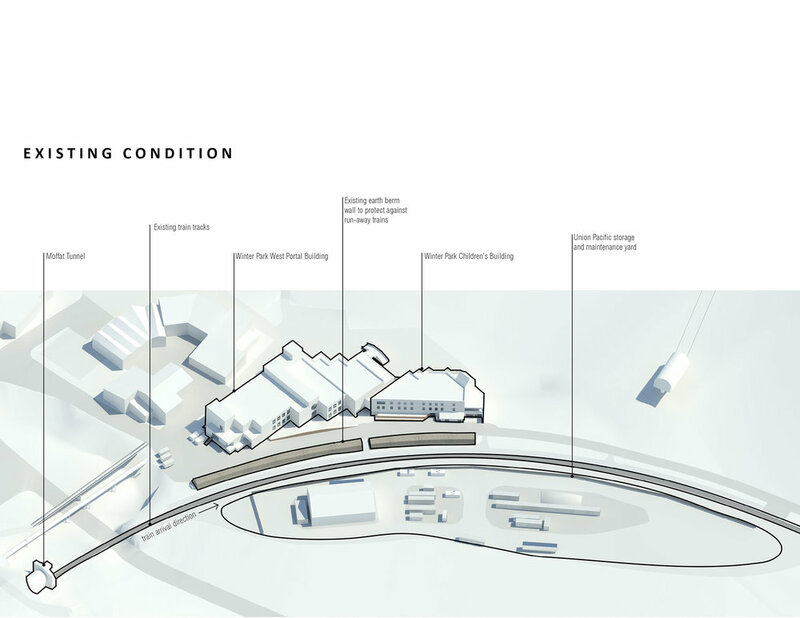 The purpose of this project is to create a flexible environment and gateway that can morph to the needs and inspire new desires in the future users Winter Park Resort.